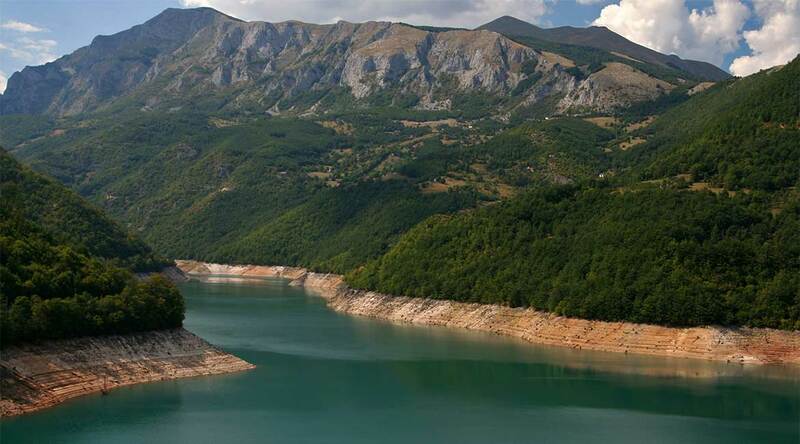 Pivsko Jezero is an artificial lake created by the construction of Hydro Power Plant ; in 1975. There is a dam, near village Mratinje 10 kilometers from Scepan Polje, which is 220 meters high and it is one of the highest in Europe. The lake itself is deep at some places more than 200 meters, and 45 kilometers long. Pivsko Jezero represents the largest reservoir of fresh water and it has fantastic conditions for doing sports activities. It is especially attractive for fishing and sightseeing residual details of the submerged canyon of the Piva river. The Pivsko Jezero is located in the Plužine municipality. The same named city of Plužine lies in the middle of the flow of the Piva river, and is the only major place in this region. Plužine is beautifully situated on the banks of the Pivsko Jezero lake in the wider part of the ravine.